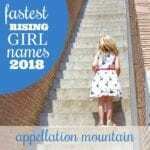 Wondering about girls names more popular than you’d guess? Maybe you’re expecting a daughter. While you’re not the most daring namer, you’d certainly like to avoid the most common names. Not the Top 100. But definitely the Top Ten, or maybe even 20. Turns out that’s harder than it looks. While the US Social Security Administration publishes their popular names list annually – the 2016 edition is expected in May – a quick scan won’t always tell you what you want to know. There are lots of factors to consider if popularity is a concern. 10,241 girls were named Harper in 2015. That stat caught my eye. It’s not quite the cut-off for the Top Ten – Madison, the #11 name, was also given to more than 10,000 girls. And yet, it’s an interesting benchmark. 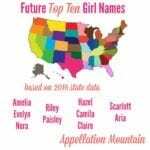 Because it turns out that these ten names were also given to more than 10,000 girls in 2015 if you add up all of the alternate spellings. Amelia – Amelia ranks #12, which nearly 9,800 births in 2015. 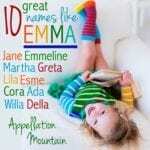 Add in another 2,200 newborns called Emilia, plus over 500 named Emelia, and this name easily enters the Top Ten. Avery – Take 9,200 girls named Avery, then add in another 800+ called Averie, and nearly 400 spelled Averi and this name, too, rises in use. Chloe – Blame it on the Kardashians. Former Top Ten Chloe was given nearly 7,900 girls in 2015. That’s pretty popular. 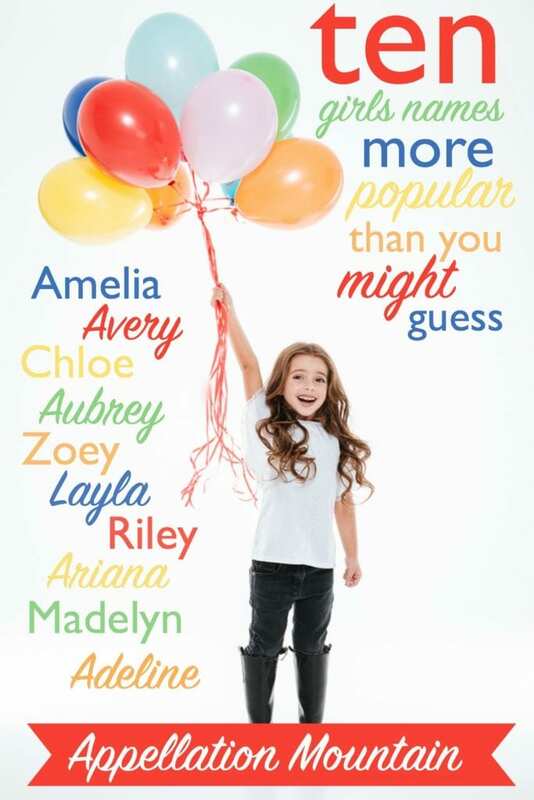 Factor in nearly 3,000 with the Khloe spelling, and it makes the list of girls names more popular than you’d expect. Aubrey – Like Avery, it’s the different endings that boost Aubrey from #21 to just outside the Top Ten. Take almost 7,400 girls named Aubrey, and add in 3,600 girls called Aubree and another 670+ spelling it Aubrie, and that’s enough to lift this name. Zoey – Sometimes the most common spelling of a name changes. That’s the case with Zoey. Parents originally favored Zoe, and there were still nearly 6,000 girls given the name in 2015. But even more girls were named Zoey-with-a-y – 6,900 of them! And them together, and Zoey becomes a Top Ten name – before we count the over 350 named Zoie. Layla – Spell it Layla, and there were nearly 6,300 newborn girls with the name last year. But add in Laila, Lailah, Laylah, Leila, and Leyla and that number easily surpasses the 10,000 mark. Reasons abound to love the traditional, literary, power ballad baby name Layla, but rarity is not one of them. Another complicating factor? Add in girls named Lyla, Lily, and Lola, plus Kayla, and Layla is likely to be misheard. Riley – File Riley with Aubrey, Avery, and nearly every other ends-in-y name. But Riley inspires even more respellings – there’s Rylee, Ryleigh, and Rylie. Some of these spellings pick up on other popular names, like Kylie and Kaylee. Tally them up, and once again, Riley belongs in the 10,000+ club. Ariana – Just over 4,900 girls were named Ariana in 2015. Nearly as many answered to Arianna. Until recently the double ‘n’ spelling outranked the single ‘n’. Credit to pop singer Ariana Grande for changing our minds about the letter count. 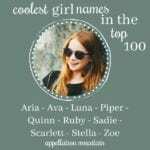 Throw in a few hundred girls named Aryana and Aryanna, and presto – a much more popular name than any one spelling’s ranking suggests. Adeline – Adeline marks the most common spelling of this name. As with Madelyn, many parents may choose a specific spelling hoping to emphasize a specific pronunciation. So Madelyn and Adeline could rhyme – or not. What’s certain is that Addie and Maddie do sound super-close – and there are plenty of both names going around. Other Adeline spellings in use include Adalyn, Adalynn, Addilyn, Addilynn, Adelyn, Adelynn, and Adilynn – plus Adaline, a spelling boosted by a Blake Lively movie. Tally all of those possibilities up, and nearly 13,000 girls received an Adeline name in 2015. The takeaway? 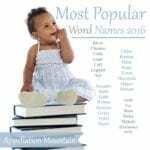 Nearly any name with multiple possible spellings can be more popular than it seems. Generally speaking, any name that ends with a -y sound, or a -lyn/-line, is likely to be respelled multiple ways. But that’s not a hard and fast rule. While I think there are some general guidelines to keep in mind when choosing a spelling, most respellings wear just fine. And yet, if you’ve fallen in love with Madeleine or Leila, it’s easy to see how the name’s true popularity could take you by surprise. Readers, which names do you hear more than you might expect? Are multiple spellings the reason? I feel like I can’t visit the kids’ school without meeting a Lucille, Lucienne, Lucinda (! ), Luciana, Lucie, Luci, Lucey, or Lucy. It’s become a bit overwhelming. The names have morphed into Meganame!